Nothing excites me more nowadays than finding ways to decorate our home with Christmas decorations! Since the color scheme of our home is my favorite blue and brown combination, I decided to start looking around for blue, gold and silver ornaments. My goodness, decorations are expensive! I kind of expected it but I was still surprised somehow. A glittery flower ornament for P59.95? Are you kidding me? That means if I get 10 pieces, it will total to P590. Ridiculous! And we all know I will definitely need more than 10! In SM Department store, I saw this beautiful blue and white flannel tree skirt. I imagined how lovely it will look with our tree and how it will perfectly match our home's colors. My heart sank when I saw the price tag. P999. I felt like that price was too step for something I will use for only 1 season. Ok, maybe more than 1. But how can I be 100% sure that we will still be living in the same apartment with the same color scheme? Men... yes, women like changing color schemes when they move houses. We like changing our look or haircolor too. But that is a whole different story altogether. Anyway, I asked the helpful lady at the department store if they had any cheaper tree skirts. She said they had, but they all came in the traditional red and green color combo. Walking away disappointed, an imaginary light bulb suddenly turned on! Round table cloths! They can work! I immediately walked over to the table linen section. I looked for the smallest white round table cloth I could find. Cha-ching! P379.75 only! I wanted to jump for joy but decided to just do that in my head. Yay! We now have a tree skirt! 1. Cut the hole of the center of the cloth. Finish the edges by sewing it. If I am too lazy to do that, I will just seal the edges with colorless nail polish. Mostly likely I will be doing the latter. 2. I will cut across the cloth: from the end to the center. Will seal the ends too with colorless nail polish. 3. 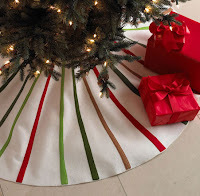 Wrap the base of the tree with my impromptu skirt! I do not, by any means, have Martha Stewart skills. I panicked a little bit and wondered if my 3-step plan will work. Wimpy me Google-d it and see if anyone did it already. My search did not yield any significant results but I did come across Kattitudes.com. She "upgraded" my idea to embellishing them with ribbons! Beautiful! Very clever! Now I plan to dig in to my mom's big box of ribbons. I know she has blue and brown and maybe even polka-dotted ribbons. I just know it! I am excited to go home and decorate our very first married Christmas tree!